This 13-Days Gorilla Safaris in Uganda involves a short tour of Kampala City on the day of arrival, Lake Mburo National Park, Bwindi Forest Park, Queen Elizabeth Park, Kibale and Semuliki National Parks. Arrive in Uganda and transfer to Kampala, check in your hotel. Overnight at Acacia Lodge, Kampala Lodge on Half Board. Take your breakfast and leave Kampala in the morning driving for about 4 hours towards western Uganda. On the way, you will cross the Uganda Equator line in Mpigi and move further as you appreciate the green vegetation beauty of Uganda. 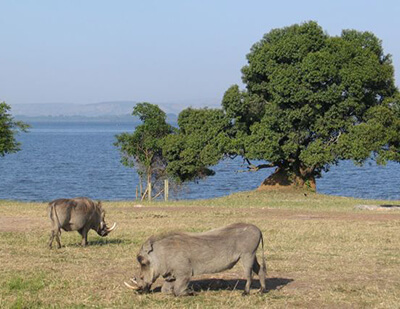 Arrive at the park around midday and have lunch at the lodge and then use the after for a boat ride on Lake Mburo and a game drive in the evening in search of zebra, impala, eland, topi, oribi, cape buffaloes and if you are lucky, Roan antelopes, leopards, hyenas and jackals will come to your sight. Dinner and overnight at Mantana tented Camp or Rwonyo Rest Camp. Have breakfast early enough drive to Bwindi Impenetrable Forest National Park, the thick home of the rare mountain gorillas. Have a community for a cultural performance and then after retire to Gorilla Safari Lodge, Gorilla Mist Camp for dinner and overnight. Bwindi Impenetrable National Park inhabits almost half of the world’s 650 mountain gorillas. Start climbing early with a tracker even though seeing gorillas depends on their day’s movements. Gorillas are naturally reserved and non-violent animals. And it’s a memorable and thrilling moment to watch them and possibly photograph these mild giants at a close range. Return to the camp in the evening for overnight and dinner. Take breakfast and leave for Queen Elizabeth National Park going through the southern zone of the park known as Ishasha, well-known for its tree-climbing lions. This Park is a UNESCO World Biosphere with one of the highest biodiversity ratings of any game reserve in the world. About 100 mammal species and a significant 606 bird species like Elephants, hippos, the elusive giant forest hog and the handsome Uganda kob are accommodated there are and frequently seen. Overnight and dinner at Jacana Eco-lodge which has pleasant visitor cabins and complete facilities, Mweya safari Lodge or Institute of Ecology. On the second day in the Park, have breakfast and leave for an early forest walk in Kyambura Gorge in search of primates and chimpanzees. Return to the lodge for lunch and have a boat excursion along the Kazinga Channel for a prospect to see hippos a close range from the boat and buffalo in the shallow waters. Kazinga Channel shoreline is a home to a collection of birds like the pink backed pelicans, fish eagles, pied and malachite kingfishers, saddle billed stork and many more. Dinner and overnight Jacana Eco-lodge, Mweya Safari Lodge or Institute of Ecology. Enjoy this day having wildlife activities, starting with an early game drive through the park where you will see Lions, Elephants, Leopards, Buffaloes, Hyenas and an assortment of antelope types before driving back to the same lodge for lunch. In the afternoon, you can either go for a splendid sightseeing in the crater section. Visit the Katwe Salt works to see how salt mining is done traditionally, head to the flamingo village and sightseeing in the crater region, which is awesome. Alternatively on the same day in the afternoon, go on forest walk leading to the large bats cave where bats in large numbers reside as well as a rock python regularly seen by the visitors. It’s an astonishing forest walk one cant afford missing. Retire to the lodge for dinner and overnight. Have mini morning game drive and depart after breakfast for Kibale. Have the benefit of game viewing en-route toward Kibale Forest National Park. You will be staying for two nights at the Ndali Safari Lodge, Primates safari Lodge, Rwenzori View guest House, Rujuna Top Guest house, Kanyankyu Tourist Camp. Take your breakfast and drive into Kibale Forest National Park to hike. A guide will enlighten you on the primates you are to see as well as the forest plants and animals. This morning hike will expose your eyes to chimpanzees, phoestes, red-colobuses and red-tailed and grey cheeked Manga-beys. Return to the lodge for lunch and in the afternoon, visit Bigodi swamp, an astonishing place to watch rare and gorgeous flora and fauna. Dinner and overnight at the lodge or guesthouse. Drive to the Semuliki in the Western Rift Valley. The reserve has an immense combination of animals like the chimps, elephant, lion and buffalo plus a crowd of African antelope species. A night drive planned to look for the fantastic nocturnal species such as large spotted genet, African scopes owl, pearl dash spotted owlet and night jars is another rewarding opportunity. Spend your overnights for two days at the beautiful Semuliki Safari Lodge, the only accommodation in these 500 square kilometers of wilderness. The lodge has gourmet food, classified tented rooms with en-suite facilities, huge four poster beds and swimming pool. It’s a place to sleep with fears. Have breakfast and take a boat trip on Lake Albert to view the dazzlingly coloured colonies of red-throated bee-eaters and the incredible Shoebill. The lake is lovely with sand cliffs, waterfalls and small fishing villages on its shores. Get back to the lodge via a palm forest and the acacia Savannah and keen to see mammals and different species of raptors. Enjoy your wonderful lunch and then after, use the afternoon having a game drive to conclude the day. Wake up early for a morning tropical forest expedition for bird viewing and tracking of the wild chimpanzees and then take your late breakfast. Checkout and drive back to Kampala where you arrive in the afternoon and then to Entebbe for dinner and overnight.